The siege of Aachen by the Spanish Army of Flanders under Ambrogio Spinola in 1614. Oil on canvas. Attributed to Peter Snayers. The War of the Jülich Succession was a military conflict over the right of succession to the United Duchies of Jülich-Cleves-Berg. It lasted between 10 June 1609 and 24 October 1610, resuming in May 1614 and finally ending in 13 October 1614. The first round of the conflict pitted Catholic Archduke Leopold V against the combined forces of the Protestant Margraviate of Brandenburg and Palatinate-Neuburg, ending in the former's military defeat. The representatives of the Brandenburg and Neuburg later entered into a direct conflict after their religious conversion to Calvinism and Catholicism respectively. The conflict was further complicated by the involvement of Spain and the Netherlands making it part of the Eighty Years' War. It was finally settled by the Treaty of Xanten, provisions of which favored Spain. The rapid spread of the Lutheran and Calvinist doctrines following the schism of Roman Catholic Church was met by a period of Catholic resurgence known as Counter-Reformation. Such interdenominational conflicts as the Cologne War and Strasbourg Bishops' War prompted creation of the Catholic League and the Protestant Union, with the intention of safeguarding the interests of the Holy Roman Empire's Catholic and Protestant nobility respectively. The aforementioned alliances entered their first conflict in 1609, when a succession crisis in the United Duchies of Jülich-Cleves-Berg sparked the War of the Jülich Succession. The territories in question covered an area of 14,000 km², having both geopolitical importance due to their proximity to the Spanish Road and a booming economy which was fueled by refugees fleeing the lands ravaged by the Eighty Years' War. The mentally ill duke Johann Wilhelm died on 25 March 1609, leaving no children to succeed him. Emperor Rudolf II had claims to the duchies stemming from intermarriage, however he was unable to openly declare his intentions without compromising his perceived neutrality. A total of six other claimants appeared, with rulers of the Margraviate of Brandenburg and Duchy of Palatinate-Neuburg having the only credible claims through their marriage to Johann Wilhelm's aunts. On 2 April, a regency was established, including the duke's wife Antoinette of Lorraine, the privy councilors and an imperial commissioner. On 24 May, Rudolf II announced that the Aulic Council was to provide a definite verdict within four weeks. Brandenburg and Neuburg viewed the regency as a direct attempt at annexing the duchy. On 10 June 1609, they signed the Treaty of Dortmund [de], rejecting all other claimants and establishing a provisional government together with the local estates. Their troops entered the duchy in defiance to the acting regency and the Emperor. In January 1610, Henry IV of France signed a draft military pact with the Protestant Union, dispatching 22,000 men under Marshal de La Chatre to north–east France. A comparable number of troops was dispatched by the Dutch towards Schenkenschanz, in an apparent show of force towards Spain. Archduke Leopold V sought to raise his profile in the ongoing power struggle between the Emperor and Archduke Matthias by convincing the former to annul the Treaty of Dortmund and appoint him as the imperial commissioner. Leopold triumphantly entered Jülich, however he soon found himself besieged by an army three times his size, as fighting spread to Aachen and Düren. The struggle between the Catholic royal family and the Protestant princes brought fears of a larger religious war. The Protestant Union mobilized 5,000 men, while Leopold recruited 1,000 cavalry and 3,000 infantry in the Prince-Bishopric of Strasbourg. His Habsburg relatives and the rest of the Catholic League refused to openly support Leopold, only gathering troops for their own protection. On 13 March 1610, the Protestant count Otto von Solms–Braunfels invaded Strasbourg with 2,000 troops. The Catholics simply retreated into walled towns such as Saverne, waiting until the ill–disciplined invaders ran out of money and retreated. 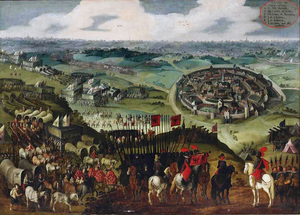 A meeting was set in Prague on 1 May 1610, in order to broker a settlement. Rudolf's initial decision to enfeoff the entire duchy to Christian II, Elector of Saxony was rejected by a number of moderate princes, leading to postpone further negotiations until August. A second Protestant invasion, this time consisting of 9,800 troops and artillery, succeeded in seizing Dachstein, Mutzig and Molsheim, however it was also brought to halt after the local population refused to supply it food. In the meantime Leopold fled Jülich, leaving 1,500 troops inside. Their fate was sealed as the Kingdom of France and the Dutch Republic finally intervened in support of the Protestants, aiming to antagonize Spain by putting further pressure on the Spanish Road. The Dutch intercepted a relief party heading from the Prince-Bishopric of Liège, while also bolstering the besiegers into a combined total of 25,200 troops. On 1 September, the garrison surrendered in return for free passage into upper Alsace. On 24 October, the Protestant Union and the Catholic League agreed to withdraw their forces and disband them until the end of the year. The war severely depleted the coffer of all the involved parties, leading to increased taxes which in their turn triggered the 1612 Tirol Peasant Revolt. Possessors Wolfgang Wilhelm, Count Palatine of Neuburg and Joachim Ernst, Margrave of Brandenburg-Ansbach took over the duchy by military might, without being able to secure official recognition. In 1611, Protestantism spread to the villages of Stolberg and Weiden in the vicinity of Aachen. In response, the city council of Aachen imposed a fine on those inhabitants who attended these services. Five citizens were detained for ignoring the town's decree and banished as they refused to pay the fine. This caused a riot against the council on 5 July. The Catholic counselors were expelled and many Catholic buildings were sacked. The rebels assaulted the church and the College of the Jesuits, smashed the altars and images, and held a mock mass dressed in confiscated priestly garments. A new Protestant council was established and appealed for support to the Possessors. In 1612, Rudolf ordered the Possessors to reinstate Catholicism in the city of Aachen under the menace of a ban. The city's Protestants, however, ignored the command and seriously wounded an Imperial commissary sent to implement the Emperor's edict. On 13 October 1614, Spinola and Maurice of Nassau initiated peace negotiations under French and English mediation. The conflict ended with the signing of the Treaty of Xanten on 12 November. The territories of Jülich-Berg and Ravenstein went to Wolfgang Wilhelm of Neuburg, while Cleves-Mark and Ravensberg went to George William. Spain gained a total of 62 towns including three crossings across the Rhine river, namely Wesel, Orsoy and Rheinberg, significantly enhancing its position in north–west Europe. The Dutch retained their garrisons at Jülich and Pfaffenmütze; nevertheless they were now outflanked or even isolated, putting them in an unfavorable position when the Twelve Years' Truce expired in April 1621. ^ Wilson 2011, pp. 229–232. ^ Wilson 2011, pp. 232–236. ^ Wilson 2011, pp. 236–238, 252. ^ Duerloo 2012, pp. 343. ^ a b Janssen 1906, pp. 564–566. ^ a b c Wilson 2011, pp. 252–253. ^ Janssen 1906, pp. 564–567. ^ Duerloo 2012, pp. 347, 369. ^ Lawrence 2009, pp. 79. ^ Van Nimwegen 2010, pp. 79. ^ Hayden 1973, pp. 22–23. Duerloo, Luc (2012). Dynasty and Piety: Archduke Albert (1598–1621) and Habsburg Political Culture in an Age of Religious Wars. Ashgate Publishing. ISBN 9780754669043. Hayden, Michael (1973). "Continuity in the France of Henry IV and Louis XIII: French Foreign Policy 1598–1615". Journal of Modern History. University of Chicago Press. 45 (1): 1–23. doi:10.1086/240888. Retrieved 8 May 2016. Janssen, Johannes (1906). History of the German People at the Close of the Middle Ages. Vol. X. Leading up to the Thirty Years' War. London: K. Paul, Trench, Trübner, & Co., Ltd. OCLC 1520859. Lawrence, David (2009). The Complete Soldier: Military Books and Military Culture in Early Stuart England 1603–1645. Boston: Brill Academic Publishing. ISBN 90-04-17079-0. Van Nimwegen, Olaf (2010). The Dutch Army and the Military Revolutions 1588–1688. Woodbridge: The Boydell Press. ISBN 978-1-84383-575-2. Wilson, Peter (2011). The Thirty Years War: Europe's Tragedy. London: Belknap Press. ISBN 978-0674062313. This page was last edited on 13 May 2018, at 22:11 (UTC).